"QCP is launching it’s 6th publication featuring the highly innovative and experimental work of Renata Buziak, the first in a series of smaller monographs. This 48-page bilingual (English/Polish) book includes all of Buziak’s Afterimage series, as well as a comprehensive essay by Dr Victoria Garnons-Williams and a foreword by renowned American author Lyle Rexer; translations by Małgorzata Sady". The publication is available from 30 April 2010, $35 + postage from the QCP book store, the artist and selected book shops. Dr. Victoria Garnons-Williams lectures at Queensland University of Technology in the Creative industries Faculty. 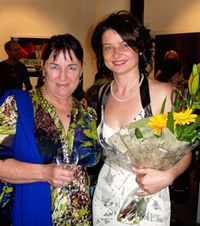 She was the recipient of a QUT Vice-Chancellor’s Performance Award in 2009 for her outstanding work in the Faculty Core unit, Photomedia and Artistic Practice. Lyle Rexer is an independent scholar, critic and curator based in Brooklyn, New York. He is the author of several books, including "The Edge of Vision: The Rise of Abstraction in Photography". He writes for many magazines in the United States and internationally and is a contributing columnist to Photograph Magazine. He teaches at the School of Visual Arts in New York. Victoria Garnons-Williams and Renata Buziak at the launch. QCP wydaje szóstą książkę, tym razem ze innowacyjną i eksperymentalną sztuką Renata Buziak. To 48 stronicowe angielsko-polskie wydanie zawiera wszystkie prace z cyklu ‘Afterimage’, na podstawie wspomnień z dzieciństwa w Polsce, oraz tekst Dr Victori Garnons-Williams i przedmowę wybitnego krytyka Lyle Rexer, z przekładem Małgorzaty Sady. Dr Victoria Garnons-Williams wykłada na Queensland University of Technology w Creative Industries Faculty. W 2009 roku otrzymała nagrodę QUT Vice-Chancellor’s Performance Award za wybitne osiągnięcia w pracy w Faculty Core Unit, Photomedia and Artistic Practice. Lyle Rexer - niezależny badacz, krytyk i kurator z siedzibą w Brooklynie w Nowym Jorku. Jest autorem kilku książek, m.in. The Edge of Vision: The Rise of Abstraction in Photography. Pisze do wielu czasopism w Stanach Zjednoczonych i na całym świecie, felietonista w Photograph Magazine. Wykłada w School of Visual Arts w Nowym Jorku. Queensland Government through Arts Queensland, Queensland College of Art Griffith University, ‘Polonia’ Polish Association of Queensland, The Polish Place , Global Eyes Optometrist, Spiro Grace Art Rooms, Kayell Qeensland/RGB Digital and Brisbane Digital Images for supporting this project. Podziękowania dla Rządu Stanowego w Queensland, Queensland College of Art Griffith University, ‘Polonii’ Stowarzyszenia Polaków w Queensland, The Polish Place, Global Eye Optometrist, Spiro Grace Art Rooms, Kayell Qeensland/RGB Digital i Brisbane Digital Images za wsparcie w tym przedsięwzięciu.